“If you look out the window of this classroom you will see Miguel Street being performed right in front of us,” I said. Indifference settled on all of their faces, some bit their nails, other fidgeted in their seats, and they all waited for the torture session to be over. They were accustomed to reading literature that validated the Western world; yet, simultaneously, placing them as the other. As a result, they were unable to see Naipaul’s Trinidadian characters in their full humanity because this recognition would force them to grapple with their own otherness as readers. I had to make this a teachable moment and challenge their notion of otherness. I paused the discussion and issued a Venn Diagram worksheet to the students. On one side of the circle, the students had to write about a time in their lives when they’ve felt alienated, and on the other side of the graphic organizer they wrote about the narrator’s alienation. In the connecting circles, they connected to the story by showing the similarities between themselves and the characters. The students were surprised that they were more similar to the characters than different. Through the Venn Diagrams, the students were able to remove the gaze of otherness and actually see the beauty and feelings the story was conveying. At the Asian University for Women, I was the only black instructor – “the other” and I was teaching about – “the other” to a diverse group of outspoken Asian young women who are considered the –“the other” in literature, politics and within their own homes. For the last eight-years I’ve taught literature of “the other” all over the world—China, Bangladesh, France, and at Eagle Hill School, a small private school in rural New England. As the constant “other” teaching about “the other” I teach my students that “otherness” is a social construct, and as a result the concept takes on different attributes in different settings. My goal in the classroom is to teach students to find the universal when they encounter the other in literature. In their search for the universal they’d find themselves, and hopefully they’d start to ask necessary questions that divides – Who is the other? When do they become the other? Who gets to decide? At first, all of my students are resistant to see the similarities between the other and themselves because they want to maintain their superiority position. This gives them a sense of self-importance and validates them. In order to encounter the other and see them as people equally to them, but with a different experience, my students have to shift their superiority position. The students work on graphic organizers, self-reflection essays, and group projects to shift their gaze. 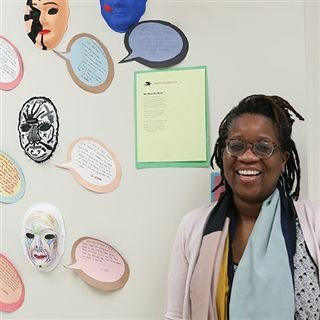 One profound project that I’ve found essential in helping students encounter the other and at the same time dismantle the concept of otherness is a multimodal project called, “we wear the masks”. In this project, students have to paint two paper mache masks—one for themselves, and one for any character from the novels we have read throughout the semester. They have to write a brief summary (using the first person pronoun) why they wear the mask and why does that character wears the masks. 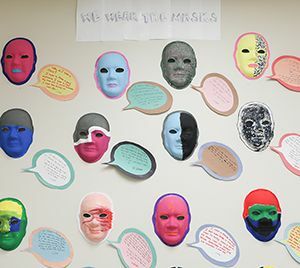 Afterwards, the masks and the quotes are displaced for the rest of their classmates to see and read. Students aren’t able to distinguish what quote is from the character or their fellow classmates. This writing project merged abstract thinking (a necessary writing ingredient) to their personal stories. Learning is emotional, and when students in developmental writing courses are able to connect to education via their personal stories they are able to heal from past learning trauma, become more self-reflective, and slowly break down the barriers that has prevented them from learning and gravitate to the academic world. As I teach students all over the world to encounter the other and themselves, the goal is not for them to encounter “otherness” with a sense of charity and mystery because that would maintain their sense privilege and essentially dislocate them from the text. But the goal is to show them that all literature (regardless of its location) is supposed to lead us into the empathic chambers of humanity and let us dwell there for eternity.